Heidsieck, the champagne house that landed on the map when founder Florens-Louis Heidsieck presented his wine to Queen Marie-Antoinette, owns 47 of these chalk pits. Unlike some of the neighbouring champagne houses that own chalk cellars, Heidsieck is not open to the public, so the crayeres have a gentle, ethereal quality, enhanced by the ‘cathedral’ style in which the caves have been dug out. Every corner turned reveals another enticing stack of bottles and magnums. At any one time there are 20 million vessels of champagne stored here. 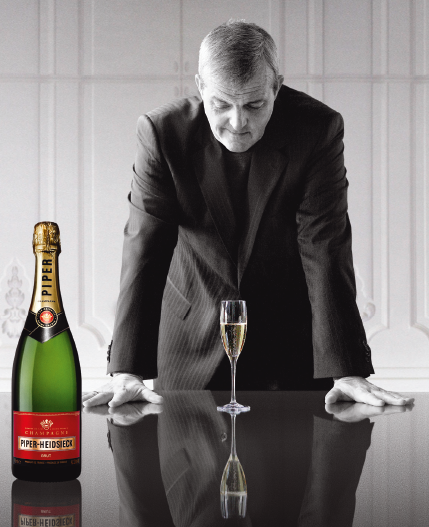 While the legal minimum period for second fermentation is 15 months, Piper-Heidsieck bottles are stored in the crayeres for at least 24 months and its more expensive Charles Heidsieck label (created by a descendant of Florien, nicknamed Champagne Charlie by the Americans) for a minimum of 36 months. Wine maker Regis Camus believes this allows the fruit and body of the pinot noir to fully develop in the blend. Maison Piper-Hiedsieck is unique in that it has two labels produced by one winery and one wine maker: the award-winning Régis Camus. As the vinification process for both is the same, the different identities (crisp and citrusy for Piper, richer and fruitier for Charles) come through the blending. Which is where Régis’s skill really comes in.